We are waiting for parts so Sao did not go into the shop today. After lunch, we went on another exploration. This is something that I wanted to see for a long time. Not because it is anything particularly spectacular to see, I was just curious. When you drive on Interstate 75 near Ocala, Florida, you go under an overpass with trees on it. I thought it might be part of the corridor system for wildlife movement. 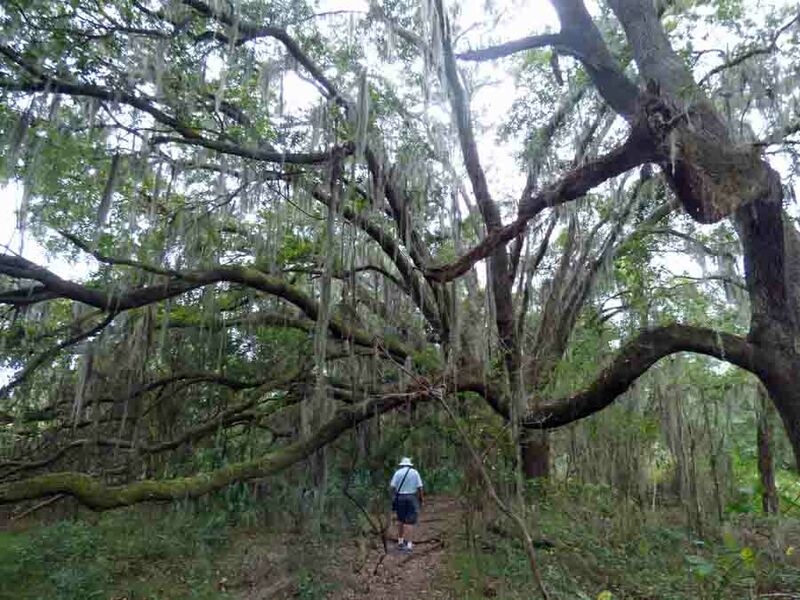 Florida has a number of corridors, greenways, and preserves. Well you just don’t see that many highway overpasses with trees growing on them. 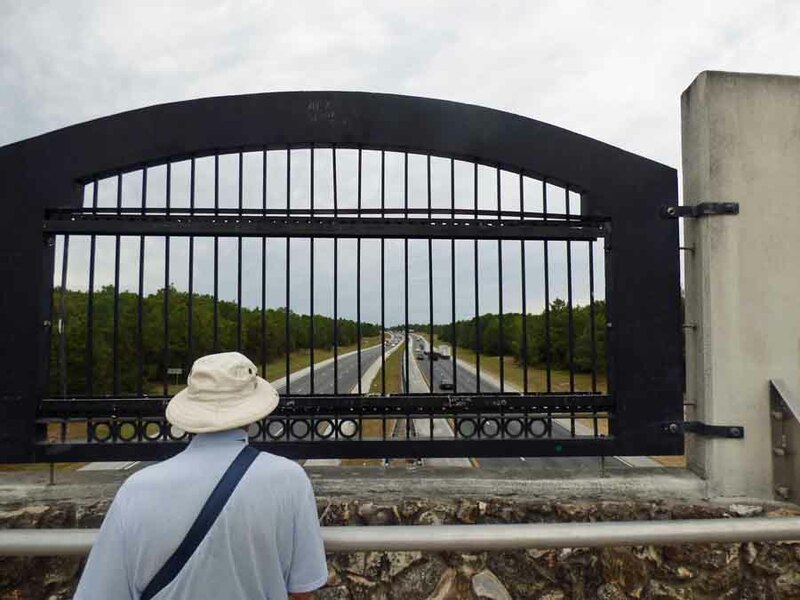 We looked it up and it is part of the Marjorie Harris Carr Cross Florida Greenway, a 110-mile long band of green across the middle of Florida from Palatka, near the east coast, to the Gulf of Mexico. It is about a mile wide in most places. 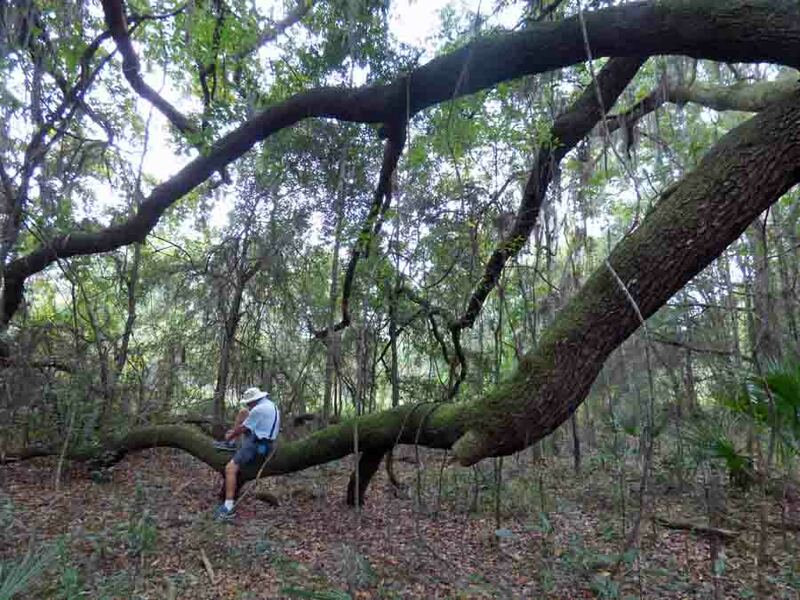 The land is part of an unfinished barge canal to link the Gulf of Mexico and the Atlantic ocean proposed by King Phillip II of Spain in 1567. Yes, 1567. Andy found the trail head that would take us to the overpass, called the Land Bridge. And we were off on an adventure. 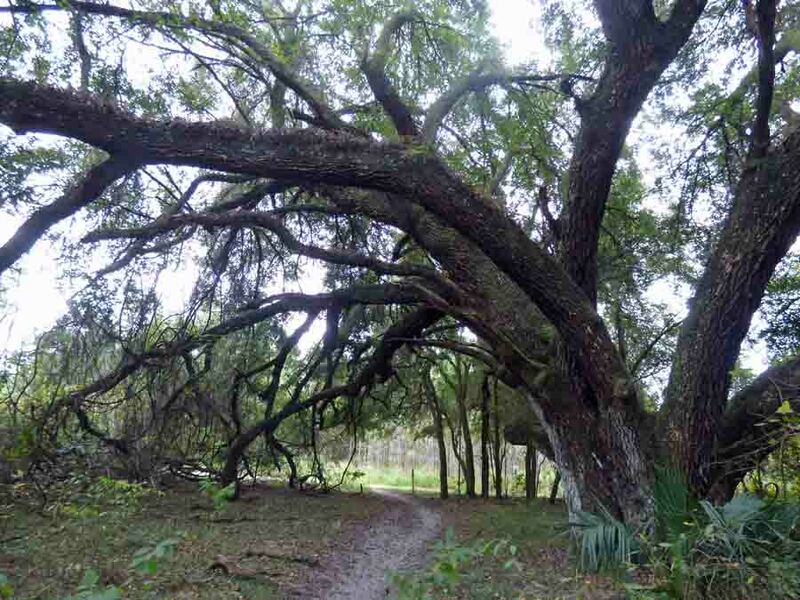 We had not even reached the trail head from the parking lot when we were awed by a Live Oak tree. 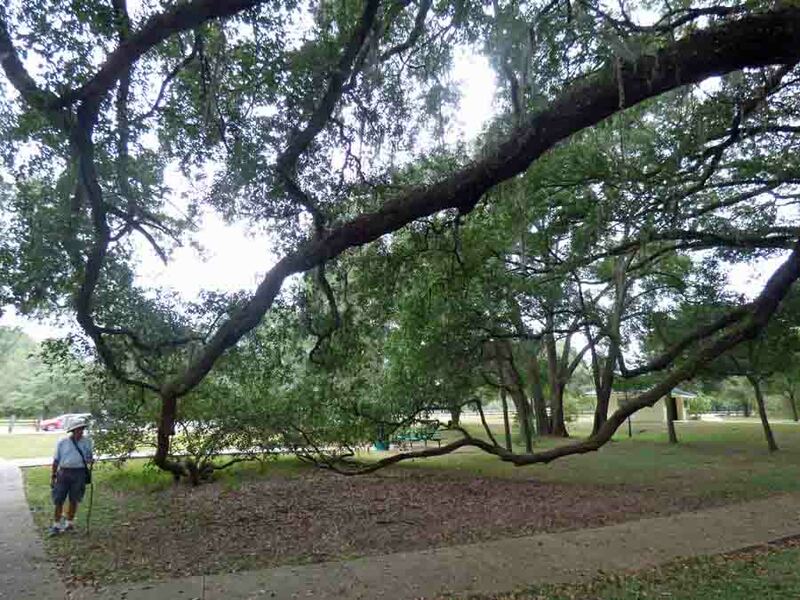 Just LOOK at those branches! I asked my scale model Andy to stay where he was while I walked closer to the tree to take a picture of him by the three long branches. They are amazing. 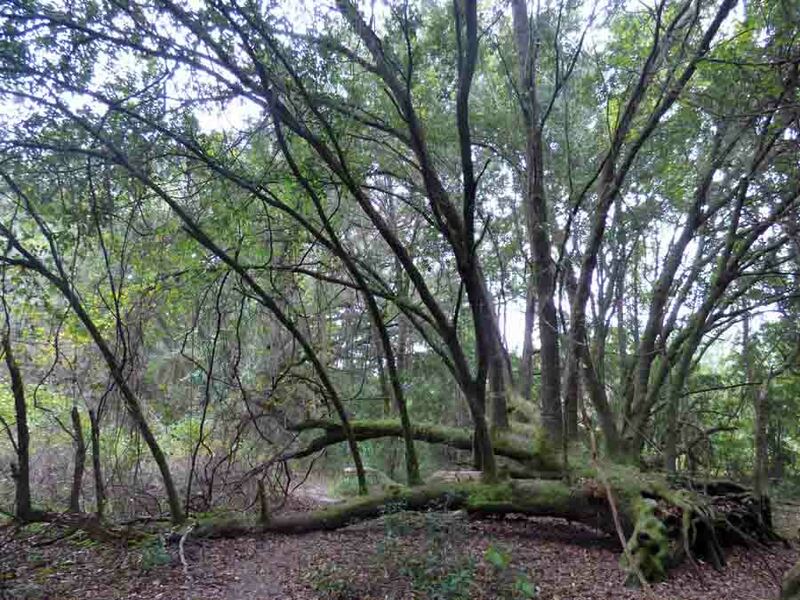 We headed on into the forest and saw more Live Oak trees. It was a surreal environment. Andy suddenly veered off the trail. I soon realized that he had found a good place to sit down and re-tie his shoes. The next odd sight we came to was a tree on the ground. It looked like a giant wooden octopus ready to grab us. 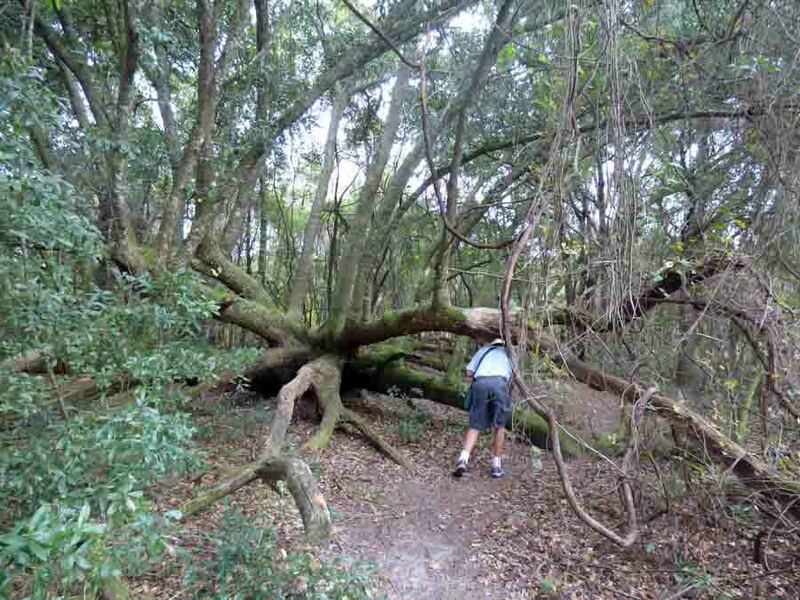 After passing under some branches and getting to the other side, we realized that a huge tree had been split in half. The half on the right was dead. 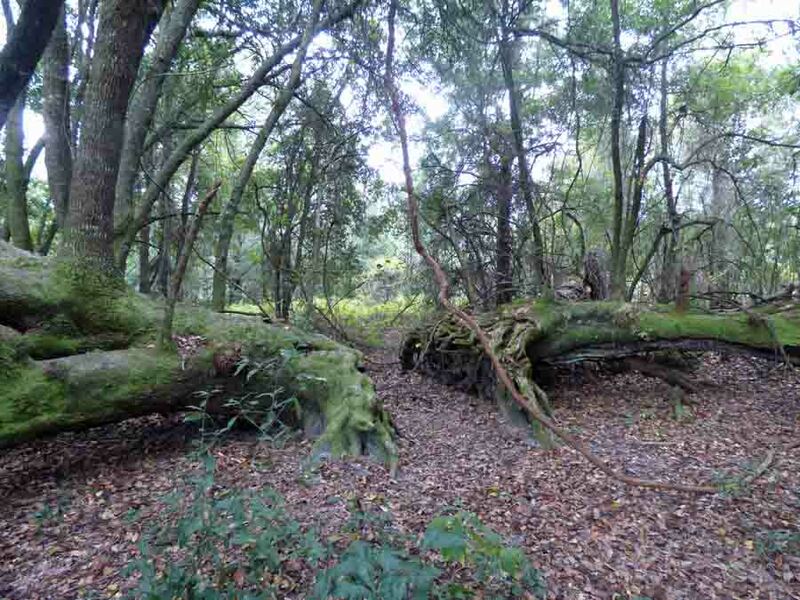 The half on the left, that we had just passed under, was alive and well and had grown a little forest. 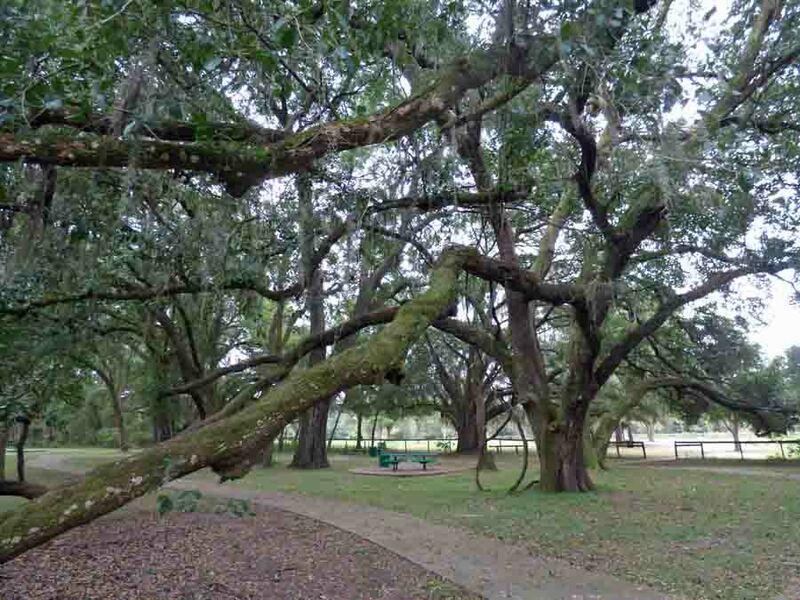 What were once branches are now upright trees. 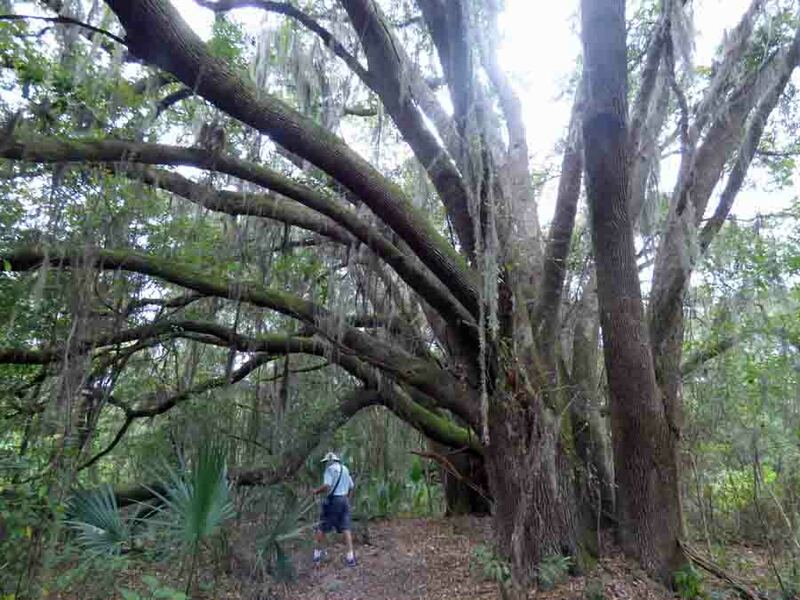 The effect of those huge trees hanging over the trail was beautiful. 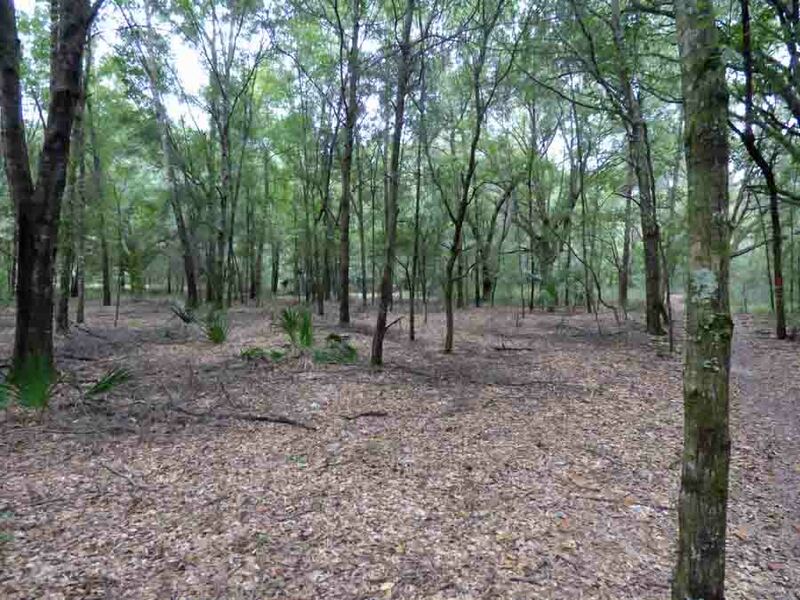 We came to an area that was clear of underbrush. Andy figured it was low lying land and is wet some of the time. Here is something else I have never seen before. Two separate trails were running alongside each other. 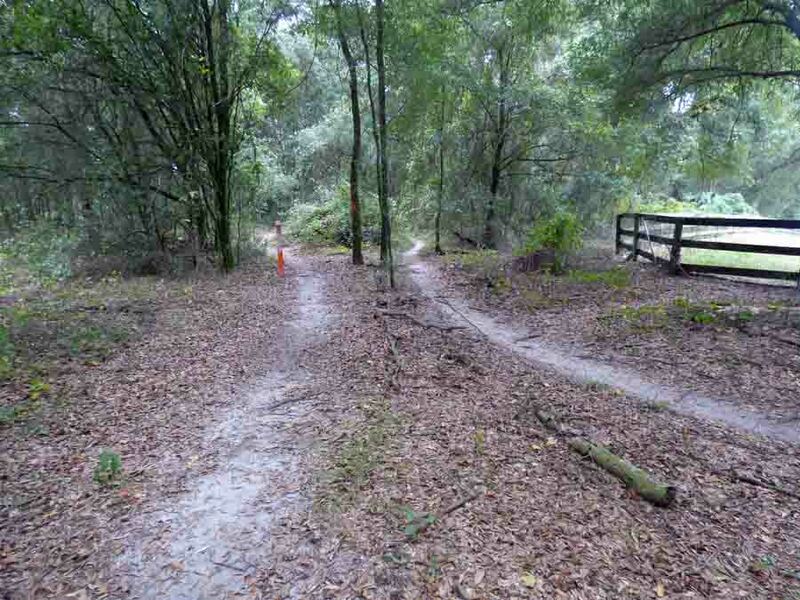 There are three trails leaving the parking area and going to the land bridge. One is for hikers, one for bicycles, and one for horses. The hiking trail goes the shortest distance, pretty much straight, well a very curvy straight. The other two trails meander back and forth and cross the hiking trail four or five times. There is also a service road. 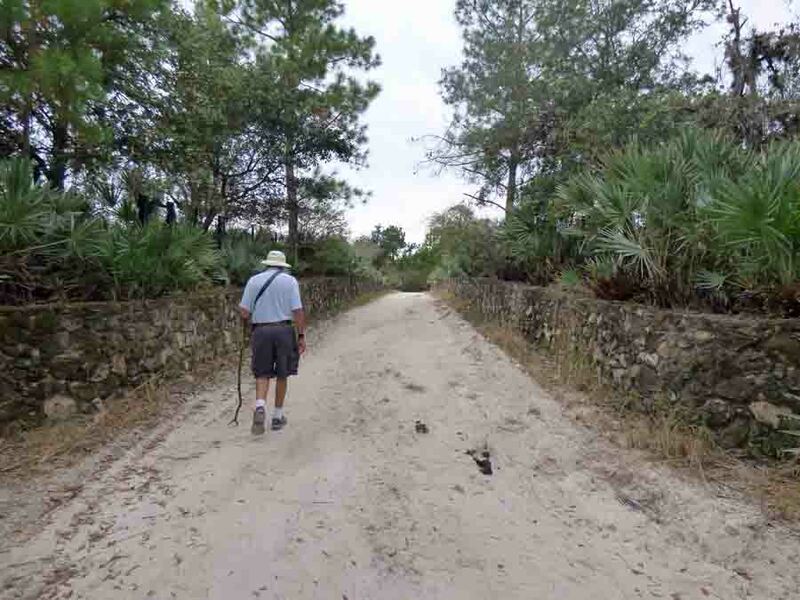 At this point, the trails were along some private property. 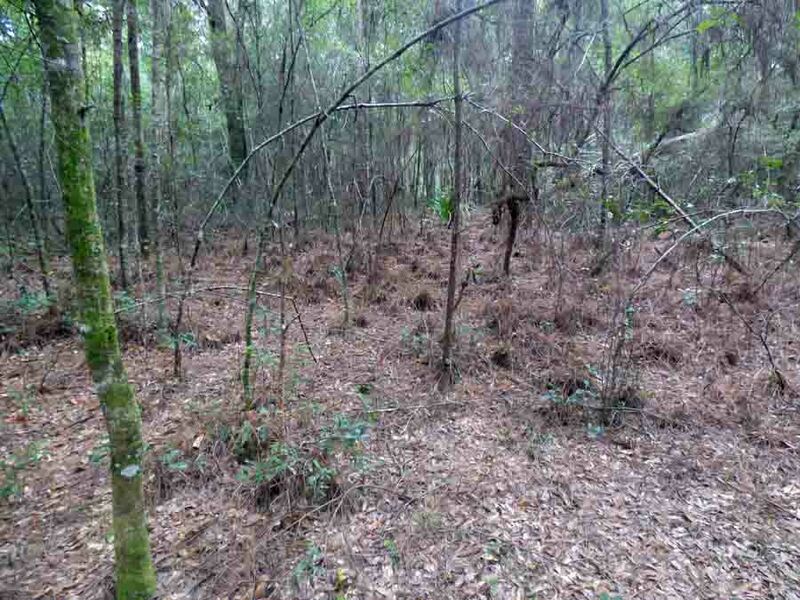 Another strange place in the woods was deep in pine straw. I love pine straw, but this area was just a bit creepy. 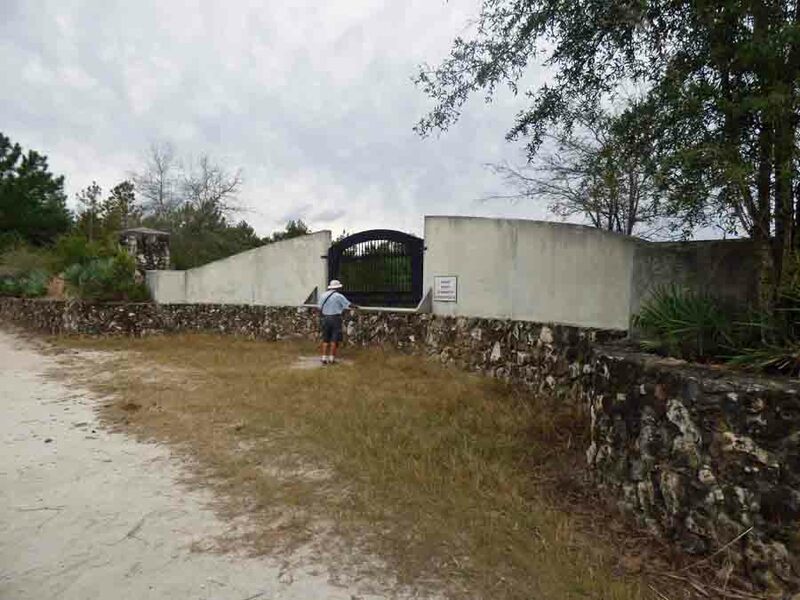 The trail is only 1.1 miles long from the parking lot to the land bridge. We could hear the traffic on I-75 well before we got to it. I was surprised to see stone walls leading to it. They are the planters for the trees and shrubs. This is the bridge, a one-lane dirt road. I widens into a courtyard at the center of the interstate and there are overlooks. They must be for people, not the animals. I-75 was busy as usual. 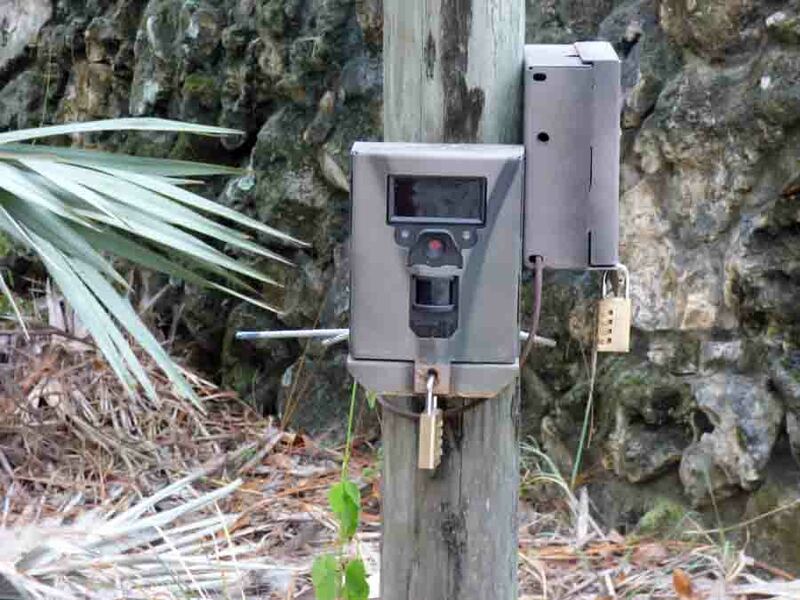 I noticed two cameras mounted on a post at the beginning of the land bridge and bent over to take a picture of them. When I stood up and turned around, Andy was posed with his walking stick like a golf club aimed at my behind. He figured that when the wildlife people see a picture of me bent over taking a picture of the camera, they will get a good laugh. That man has a strange sense of humor. 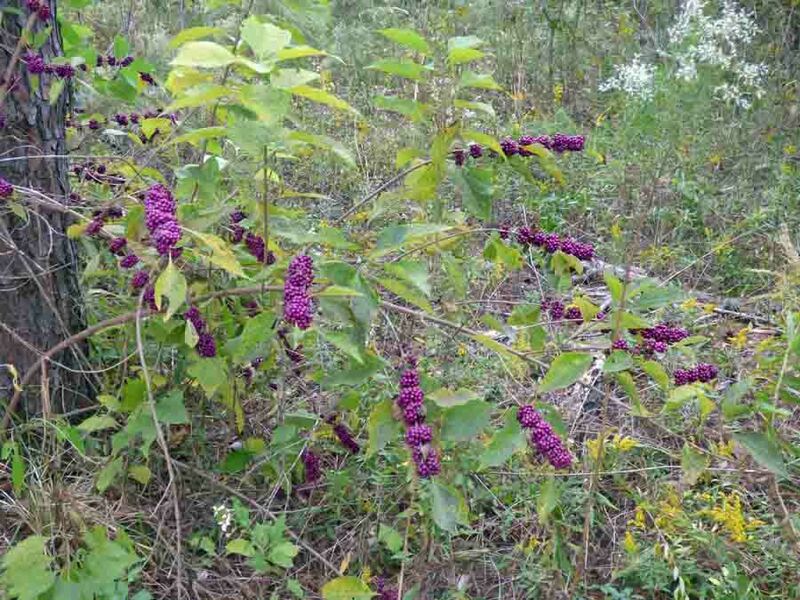 There was a bush loaded with Beauty Berries near the land bridge too. I was just reading recently that although they are edible, the birds and other animals don’t like them. They don’t eat them unless there is nothing else available. This was a photo op. 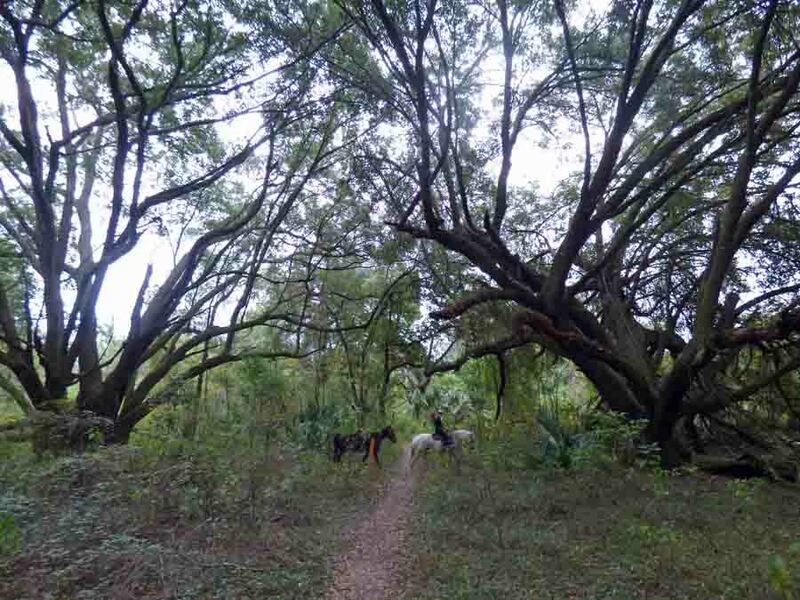 The horse trail was crossing our trail right in front of two big trees. 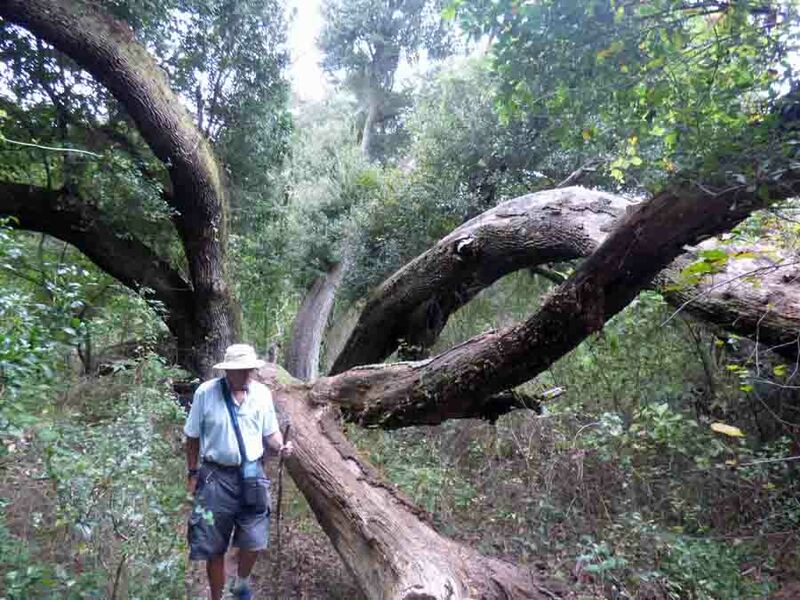 This was a group of five or six trees splayed out over the trail. We had to climb over them at the base. That was a great walk. 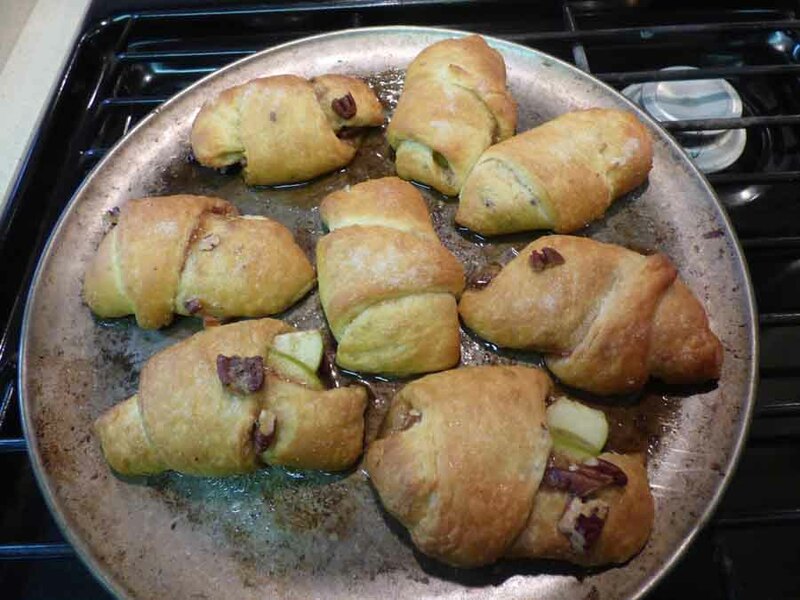 Someone had posted a link to a web site showing how to make rose shaped apple treats made with a can of crescent rolls. I bought the rolls and an apple and decided to make them tonight. That’s when I realized that I don’t have any cupcake tins. I thought I did, but can’t find them. They are probably under the futon couch under other stuff. So, I decided to roll them up. 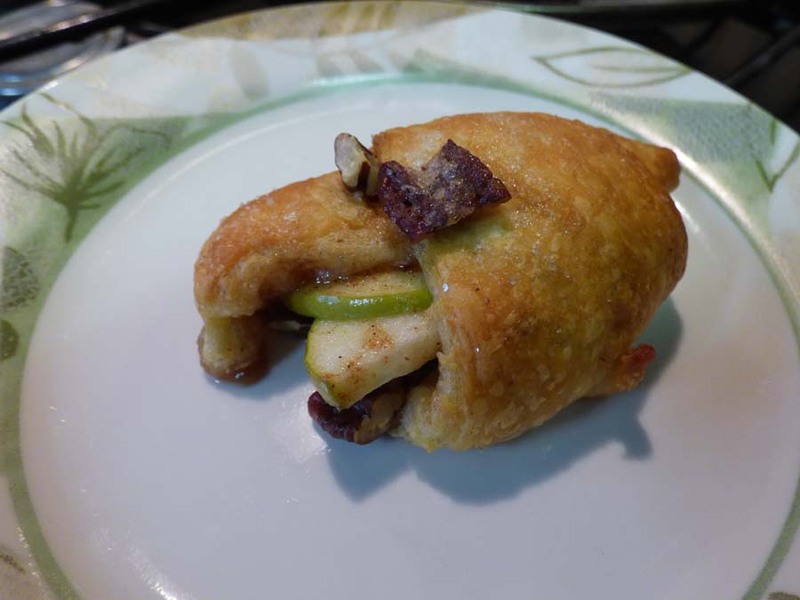 I didn’t follow a recipe; I just put in slices of apple, brown sugar, butter, cinnamon, nutmeg, and toasted pecans. They were super easy and a right tasty. Here they are when I took them out of the oven. Here is one on a plate because that’s the way those food blogs and magazines show their food. I just didn’t have a fancy plate or utensil or table cloth for drama. This looks like a great trail! Yes it is, even the small piece we did. I can picture the view the wildlife people will see of you and Andy with his raised walking stick. Hope it gives them the laugh of the day. That is what we were saying as we walked back to the car. Wondering if they would laugh and what they would say about it. I hope they did get that chuckle too.